The wedding industry is a $50+ billion business – and even though there are 2 million nuptials every year, it’s competitive. 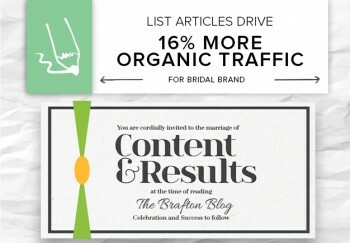 To define a space in the market and drive more traffic to its website, a bridal brand hired Brafton to create blog content for its target market. A content marketing strategy with list articles generated more organic search traffic and showed readers why they should buy from this brand (instead of all the others competing for their sales). Above all else, the content needed to be fun! Planning a wedding is hard work, and couples have a lot of decisions to make before the big day. This brand strives to make the process less stressful for budget-conscious clients, and it was important for that to come across in the articles. We created a Content strategy around those goals, and tasked our content writers with providing pieces that were trendy and digestible, easy to read and educational. What we ended up delivering to the client (and in turn saw that readers love) were list articles. Revenue from organic blog visitors has risen over 82 percent. Titles like “(X number of) unique color combinations for your wedding” and “(X number of) things to include in your wedding invitations” make up half of the most viewed articles in the blog. And in the past business quarter, organic traffic to the blog has increased 16 percent and revenue from organic blog visitors has risen over 82 percent. The top-five, round-up approach appeals to people who want to gather a lot of information without making a huge time commitment (which is why it’s great for couples who are planning weddings in their spare time). And we’ve seen that lists are one of the most successful kinds of content brands can share on social media. 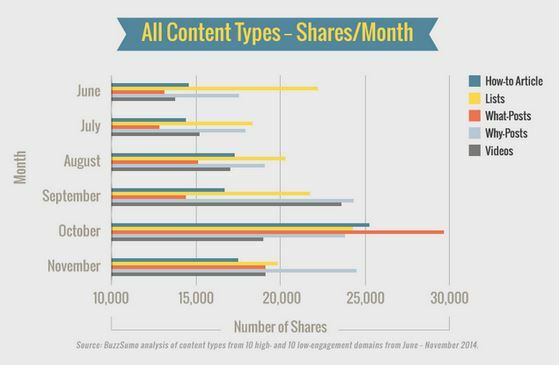 Hubspot reported that list articles consistently outperform other types of content. When people are browsing the web, they’re looking for content they can consume in a few minutes, get the gist of, and then return to their regular activities. List articles give soon-to-be brides and grooms a better idea of what they want, so they can make more refined searches going forward. This bridal brand used blog content to get a foot in the door with prospects who are looking for a brand they can trust, and then showed customers why they’re the right business to partner with as they plan for their big day.